Just announced: Together with Ack van Rooyen, Jeroen Manders, Wim Kegel and Eric Robaard I will perform at the 40th edition of the North Sea Jzz festival in Rotterdam, The Netherlands on Saturday 11 July. 4 Million plus plays on Spotify ! 4 million plays on Spotify for European Jazz Trio's 'Sad Song'. Tineke was invited to play with this incredible group to honour Wayne Shorter during the Kennedy Center Honors Gala 2018. EJT - European Jazz Trio performed concerts in South Korea and Japan en met with the gouvernor of the Saga Prefecture, Japan. This week, I earned my MSc master's degree in social science - social interventiosn from the LESI institute. Last month: Music Labs for IMD, SHELL, Global Leaders Academy London, Association of Chine Investment Enterprises. I attended the ICON conference from 08 April 2017- 12 April 2017, Kallio-Kuninkala, Finland. Here is a link to the review that Mark Werlin wrote about my CD Inventions & Variations. So great to reconnect with MCE in Brussels and run a Music Lab program at the #MCE55 event and conference. Some photo's of the keynote opening that Hein Dijksterhuis and I did for the participants of the inspiration day for leadership for the Council of the Judiciary (de Rechtspraak). Inspiring music projects for the fall 2016: Tineke Postma/Fredrik Köster, Greg Osby Quartet. Music Labs for MCE Brussels and several organisations in The Nethelands. Teaching at PCC/NAIP. 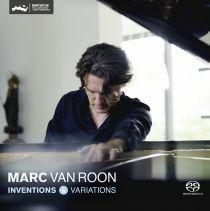 New CD Inventions & Variations has been released. Wonderful interview by brother Wim Verschuren at the Art & Spirituality day at the Zin centre in Vught, The Netherlands. I recently received this wonderful review and article by Mark Werlin - November 29, 2015, on the Marc van Roon Trio cd "Quantum Stories'. A must read! Amazing post by Charles Eisenstein. What We Do to Nature, We Do to Ourselves. I love it. A must read! The Radio 6 broadcast of the concerts at the Tineke Postma Boy Edgar concert on Wednesday 9 December. Inspiration Day: Art and Spirituality on 12 January 2016 at Kloosterhotel Zin in Werk in Vught, The Netherlands. The special concert for tomorrow, December 9 2015, is sold out at the Bimhuis in Amsterdam. Tineke Postma & Greg Osby CD 'Sonic Halo' has been nominated for the Edison 2015 award! Coming weekend I will perform with the lengedary Dutch Bugel player Ack van Rooyen and the Jeroen Manders Quintet in Germany. The Buma Boy Edgarprijs, the most important Dutch prize for jazz and improvised music, has been awarded to saxophonist, composer and band leader Tineke Postma. As part of the prize, Postma will curate a concert night at the Bimhuis on December 9, 2015. During that occasion she will be presented with the award, consisting of a sum of €12,500 and a sculpture made by Jan Wolkers. I will present my 'Score & Core' inspiration seminar at the Edutopia 2015 conference on June 12. The conference focusses on the future of education and especially on the emerging the role(s) of the teacher and the school in modern day education. Wim Kegel's CD 'Drumwise' (drum/piano duets with me) will be released Sunday May 10 at MCO, Hilversum, during a special duo concert. Remake 'A Great Day in Harlem' by photographer Merlijn Doomernik. EJT (European Jazz Trio) of which I am a member since 1995, will perform special concerts in Tokyo and Osaka on 13 and 14 December this month. On 8-10 December I am invited at the Royal College of Music in Stockholm (KMH) to lead an intensive course in 'Performance & Communication'. Today I received some photo's of the session I ran last week for the Leading the Delivery of Sustainable Value sesion for Shell International - great reminder of an inspiring session. Pacific Northwest Ballet (PNB) will perform 'Before After' (Choreography Annabelle Lopez Ochoa, music Marc van Roon) Marion Oliver McCaw Hall, Seattle, WA, USA, between Nov. 7–16, 2014. The new Marc van Roon trio performed on 29 August at the Koorzaal at the Concertgebouw (Hall) in Amsterdam. With Clemens van der Feen on bass and Tristan Renfrow replacing drummer Martijn Vink. Photos from the concert at the Frankfurt Jazz Festival now on the facebook. Sonic Halo, the CD project by Tineke Postma and Greg Osby has been pre-released at the North Sea Jazz Festivl 2014. I have been responsable for the creative production and sound design. Great to be producing again! Quantum Stories review in Korean Jazz Magazine MM Jazz June 2014! From 18-24 May 2014 I was part of a study group in Cluj-Napoca in Romania. With the group I lived and worked in the small Roma village near the garbage belt of the Cluj-Napoca town.